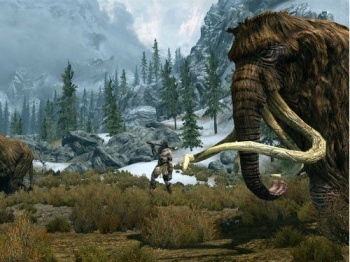 Bethesda: Skyrim DLCs "Closer to Expansion Packs"
Unlike Fallout 3, Skyrim's DLC will be all about quality over quantity. Although the rolling hills of Skyrim were born huge, we always knew that they were set to grow further with the release of DLC packs from developer Bethesda. One of the peripheral queries surrounding DLC (aside from, "Does a game this big really need inflated with anything other than new plotlines?") was just how big they'd be and how many of them we could expect to see. The answer, as it transpires, is this: DLC for Skyrim will be in the form of large and involving packs spread out over a long period of time. Quickfire Operation Anchorage and The Pitt-style releases are out; instead, according to Bethesda, we should expect to see DLC which feels more like a series of expansion packs. Speaking to Kotaku, Todd Howard, Skyrim's lead designer, laid his firm's plans out clearly. "For Fallout 3 we did five DLCs. That was a very aggressive path for us," he said. "Our plan now is to take more time, to have more meat on [Skyrim DLCs]. They'll feel closer to an expansion pack." "Because that gap is going to be bigger, we want to put little things out for free in between," Howard continued. "We've already done that for PC with the high-res pack. We're trying to figure out what those things are...We knew before release that we were going to support it in a larger way, with lots of updates every month." So! Big packs, infrequent releases. Just the way we like it, right? The question now surrounds what kind of content we're going to see in these expansion-esque packs. More plots or more towns? House-building, giant crabs, Vampire Lords and killcams? Horses that don't feel that running up to a dragon's face and bopping its nose is absolutely the right thing to do whenever one appears? Whatever it is, though, the first two packs will still be Xbox exclusives for the first month of their respective releases.